Reagan approached the campaign of 1984 at the head of a united Republican party firmly committed to his candidacy. The Democrats, as had become their custom, followed a more fractious course. Former vice president Walter E Mondale established an early and commanding lead in the race by soliciting support from a wide range of traditional Democratic interest groups, and survived challenges from Senator Gary Hart of Colorado (who claimed to represent a "new generation" of leadership) and the magnetic Jesse Jackson, who had established himself as the nation's most prominent spokesman for minorities and the poor. Mondale captured the nomination and brought momentary excitement to the Democratic campaign by selecting a woman, Representative Geraldine Ferraro of New York, to be his running mate and the first female candidate ever to appear on a national ticket. The Republican party, in the meantime, rallied comfortably behind Reagan, who was now at the peak of his popularity. His triumphant campaign that fall scarcely took note of his opponents and spoke instead of what he claimed was the remarkable revival of American fortunes and spirits under his leadership. His campaign emphasized such phrases as "It's Morning in America" and "America Is Back." Reagan's victory in 1984 was decisive. He won approximately 59 percent of the vote and carried every state but Mondale's native Minnesota and the District of Columbia. But Reagan was much stronger than his party. Democrats gained a seat in the Senate and maintained only slightly reduced control of the House of Representatives. Reagan's triumphant reelection proved to be the high-water mark of his presidency. The administration enjoyed some successes in its second term, and Reagan left office with much of his popularity intact. But beginning in 1985, he suffered a series of painful and damaging blows from which his administration was never able fully to recover. Two dramatic events shaped the second term of Reagan's presidency. One was the beginning of a momentous change in the structure of international relations—a change that the president played little part in creating but that he prudently accepted and encouraged. The other was a domestic political controversy over a secret initiative about which the president claimed—implausibly to some, all too plausibly to others—to have known nothing. Shortly after Reagan took his oath of office for the second time (in a small ceremony in the Capitol Rotunda, because bitterly cold weather had forced the cancellation of the traditional outdoor event), a new leader took power in the Soviet Union: Mikhail S. Gorbachev, who was, by Soviet standards at least, a young and energetic head of state. In the beginning, American leaders expected little from Gorbachev. He had, after all, been molded by the same stultifying political system that had shaped his recent predecessors. But to the surprise of almost everyone (including, it sometimes seemed, himself), Gorbachev very quickly became the most revolutionary figure in world politics since the end of World War II. Benefiting from widespread frustration with the rigid and ineffective policies of the preceding twenty years, Gorbachev transformed Soviet politics with two dramatic new initiatives. The first he called glasnost (openness). Glasnost led to the dismantling of many of the repressive mechanisms that had been among the most conspicuous features of Soviet life for more than half a century. Gradually it became possible for Soviet citizens to express themselves more freely, to criticize the government, even to organize politically in opposition to official policy. The other initiative Gorbachev called perestroika (reform or restructuring). Through it, he attempted to remake the rigid and unproductive Soviet economy by introducing, among other things, such elements of capitalism as private ownership and the profit motive. At the same time, Gorbachev began reshaping Soviet foreign policy. Among the first steps in that effort was his attempt to forge a new relationship with the United States. He began by reaching out to Washington for major new arms control agreements. Encouraged by British prime minister Margaret Thatcher, a friend and ideological ally of Reagan's and an early champion of Gorbachev's, Reagan too began looking for new avenues to accommodation. At a summit meeting with Reagan in Reykjavfk, Iceland, in 1986 (the second of four between the two leaders), Gorbachev proposed reducing the nuclear arsenals of both sides by 50 percent or more. Continuing disputes over Reagan's commitment to the SDI program, among other things, prevented agreements. But in December 1987, after Reagan and Gorbachev exchanged cordial visits to each other's capitals, the two leaders signed a treaty eliminating American and Soviet intermediate-range nuclear forces (INF) from Europe—the most significant arms control agreement of the nuclear age and the first to make actual reductions in existing nuclear arsenals as opposed to restricting their future expansion. At about the same time, Gorbachev ended the Soviet Union's long and frustrating military involvement in Afghanistan, removing one of the principal irritants in the relationship between Washington and Moscow. The new arms control agreements, and the rapid moderation of Soviet international behavior, seemed to Reagan and his supporters a clear vindication of the president's earlier policies. By increasing diplomatic and economic pressure on the Soviet Union, and in particular by forcing the Soviets into an expensive new arms race that their staggering economy could not support, the administration had done much to weaken the hard-liners in Moscow and make Gorbachev's reforms possible, even likely. (Reagan had always claimed that the arms buildup he launched was designed, at least in part, to encourage the Soviet Union to agree to arms reductions.) Others were more skeptical and insisted that the decay of the Soviet Union had begun long before Reagan's presidency and had intensified for reasons that had little to do with American policy. In either case, Reagan—a hard-line foe of Soviet Communism for more than forty years—proved flexible enough to respond to the changes and encourage them. For a time, the dramatic developments around the world and Reagan's continuing personal popularity deflected attention from a series of scandals that might well have destroyed another administration. Top officials in the Environmental Protection Agency resigned when it was disclosed that they were flouting the laws they had been appointed to enforce. Officials of the CIA and the Defense Department resigned after revelations of questionable stock transactions. Reagan's secretary of labor, Raymond J. Donovan, left office after being indicted for racketeering (although he was later acquitted). Edwin Meese, the White House counsel and later attorney general, finally resigned in 1988 after years of controversy over financial arrangements that many believed had compromised his office. Unnoticed at first were several larger scandals that surfaced only as Reagan was about to leave office. One involved misuse of funds by the Department of Housing and Urban Development, abuses so widespread that by 1990 the survival of the agency itself seemed in question. Another, more serious scandal involved the savings and loan industry. The Reagan administration had sharply reduced regulatory controls over the troubled savings and loan institutions, permitting them to enter into business activities from which they had previously been barred. Many savings banks responded by rapidly, often recklessly, and sometimes corruptly, expanding. By the end of the decade the industry was in chaos, and the government was forced to step in to prevent a complete collapse. The government insured the assets of most savings and loan depositors; and as the banks failed, it found itself saddled with large debts. The eventual cost of the debacle to the public ran to more than half a trillion dollars. But the most politically damaging scandal of the Reagan years came to light in November 1986. After reports of the episode had begun appearing in foreign newspapers, the White House conceded that it had sold weapons to the revolutionary government of Iran, apparently as part of a largely unsuccessful effort to secure the release of several Americans being held hostage by radical Islamic groups in the Middle East. Even more damaging was the administration's admission that some of the money from the arms deal with Iran had been covertly and illegally funneled into a fund to aid the contras in Nicaragua. 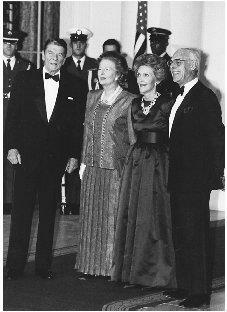 President and Mrs. Reagan entertain British Prime Minister Margaret Thatcher and her husband, Dennis, prior to a state dinner at the White House in 1988. Reagan and Thatcher were strong allies and like-minded about Cold War strategies. their influence that they proved powerless to stop the effort. The Iran-Contra scandal, as it became known, did serious damage to the Reagan presidency—even though the lengthy investigations it spawned never decisively tied the president himself to the most serious violations of the law. There were other signs in the late 1980s that the glow of the Reagan Revolution was beginning to fade. In October 1987 the American stock market—the spectacular success of which had been one of the most conspicuous features of the economic boom—experienced the greatest single-day decline in its history; and although stock prices recovered and continued to rise over the next two years, the crash shattered the aura of invincibility that had arisen in the financial markets. The 1987 crash, combined with the continuing budget deficits, gradually eroded popular confidence in Reaganomics. Ultimately, however, the president retained his hold on public affections despite the many problems of his administration. He was not, as many observers scornfully described him, in any real sense the "Teflon president," a leader to whom no failures or criticisms ever stuck. His popularity rose and fell quite dramatically at times, and the most serious scandals of his administration—Iran-Contra in particular—did him considerable and lasting political damage. But relatively few Americans were ever able truly to dislike him. And as he neared the end of his presidency—his famous energy flagging, his memory failing, his gait far less jauntily confident than it had once been—the allure of his personal style seemed to lodge itself in the public mind more securely than the much more controversial character of his policies. His last year in office was dominated, of course, by a presidential campaign in which he—for only the second time since 1968—was not a candidate. But his presence was palpable nevertheless, for it was in large part on the basis of his popularity that George Bush, his vice president, managed first to win the Republican nomination and then, after a brutal and often ugly campaign, the election. From the beginning to the end of his undistinguished presidency, Bush was dogged by the image of the man he succeeded but somehow never seemed quite to replace. Reagan retired to a comfortable home in Los Angeles, wrote his memoirs, traveled a bit, and gradually faded from public view. In 1994, after a long silence, he released a handwritten letter informing the nation that he was suffering from the early stages of Alzheimer's disease. With that courageous gesture, his public life came to an end and he entered, as he himself wrote, the "twilight" of his long and eventful life. Didn't Ronald Reagan actually lose the 1984 election to an independent as did Bill Clinton whom also comandered the White House?